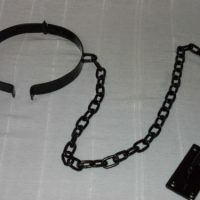 Take your pet play to the extreme with the Fetish Fantasy Extreme Heavy Duty Leash & Collar set. This industrial grade collar and leash is made from high-quality genuine leather and made to play hard. Have your submissive begging for more and obeying your every command! The thick metal chain connects to a metal clip, which connects to a solid metal D-ring. The collar attaches in the back with a leather strap and metal eyelets and buckle, ensuring your favourite pet won’t try to run away any time soon. Be the first to review “Fetish Fantasy Leash & Collar” Click here to cancel reply.